Sometimes eating gluten free is just too damn easy. Seriously! So often our meals are complicated or involve unique ingredients or substitutions. It takes time, planning, and sometimes even luck. Then there are those meals that are just...easy. So simple we tend to overlook them. Naturally gluten free and adaptable to whatever you have on hand. I made one of those meals tonight. Once upon a time, I was a vegetarian. For three and a half years I ate no meat, no meal made with stock made from meat, and no gelatin. I made sure to eat healthy, but finally was forced to reintroduce meat into my diet when even the iron supplements did not alleviate my anemia. (Uh, hel-LO! Should we maybe have been tested for Celiac back then?) Anyhow, even back in my veggie days I was not a fan of tofu. Ew! I just did not like it. I thought it was rubbery, tasteless. Needless to say, I never had tofu prepared well. Fast forward to today, tonight, in fact. 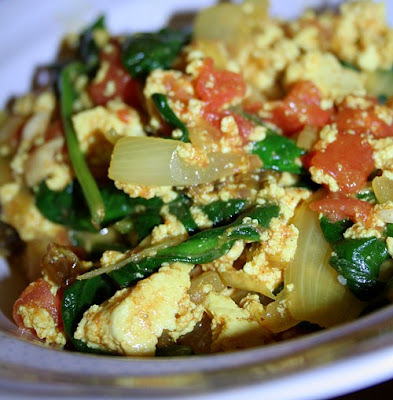 Our super easy, stress free gluten free meal: the tofu scramble. I have made friends with tofu. When prepared well, it can be divine. It can also be incredibly easy. Crumble it up, spice it up. dress it up. A full meal in 15 minutes. Add the olive oil to a big pan over med-high heat. Stir in the curry powder, and then quickly add the onions. Stir in onions, salt, and pepper and cook until the onions soften. Stir in the tomatoes and raisins, cook them for thirty seconds and add the tofu and spinach. Stir until the tofu is combined with the other ingredients and the spinach wilts. Remove from the heat and stir in the almonds. Taste and add more salt if needed. Soft, fluffy, moist, bendable. These are all words to describe the bread that I have missed for the past year and a half. French bread, Wonder bread, pita bread. All of gone in a moment. I thought that the rest of my life would be spent eating dense, brick-like crmbling loaves that are only edible after toasting. NOT ANY MORE!!! One of my girl friends recently bought a condo. Upon moving in she realized the previous owner had left behind a handful of small kitchen appliances. She offered them up and I marched home with a bread machine. I was so excited. Easy bread!!! I was cautious, though, and checked out the advisibility of using a previously used bread machine. Poop. Looked like a no go. At that point I was so excited about using the machine that it became imperative I buy one for myself. Out to the store I went. After three stops with no bread machines in sight, I began to despair. Target was my last hope. I looked through thr kitchen ailse three times before I saw one box sitting on the bottom shelf. The clouds parted, a light shown down from the heavens, and a choir of angels began to sing. Not only was it a bread machine, it was the Breadman Ultimate Plus.... with gluten free setting! I grabbed the precious and ran home. After priming the machine per the directions in the manal, I was ready to bake me up some bread. Woo!!! I did a bunch of research. I read posts all over the internets. 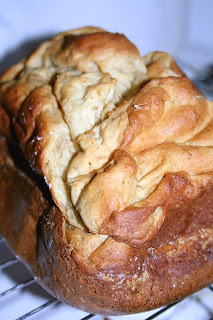 Finally, I decided to just go with the Gluten Free Pantry Favorite Sandwich Bread Mix. Um, it might be someone's favorite if it is made in the oven, but that mix is not made for my bread machine. meh. This time I decided to do something I had never done before: buy the 800 different alternative flours and xantham gun to make the bread truly from scratch. After doing some more research I settled on this recipe that was posted on ByTheBay's blog. I scooped and measured the five different flours. I ground the whole flax seed into meal in my mortar and pestle. I put the wet ingredients in first, topped them with the dry ingredients and made a little well for the yeast. I closed the lid, engaged the gluten free setting, and prayed. "Please," I beseached, "I just want it to be better than the previous loaf." A little over and hour later (yes, the cycle really is that short!) a beeping was heard throughout my apartment. I removed the loaf from the pan and set it out to cool. Put all of the wet ingredients into the bread machine pan. Gently layer the dry ingredients on top of the wet. Do not mix! Create a small well in the middle of the dry ingredients and place the yeast in the well so that is remains dry. Place the pan in the bread machine. Close the lid and set the machine to the gluten free setting or the quick rise setting. Press start. That is all. If the loaf turns out to be too dense or if it falls, try redicing the water by 2-3 T. You can slice and freeze this loaf, but there is really no reason. This bread was still just a fresh the next day. Speaking of which, I need to go have a slice, untoasted and with no topping. Yes, it is just that good!